Life ain’t fair. For example this is one of the best cakes I’ve had in a long time, yet the pictures didn’t turn out as I intended. At all. I was in a rush and I had to take them quickly. Here is a word of advise from me: Don’t take pictures under pressure unless you really know what you are doing! This cake however… oh, my! 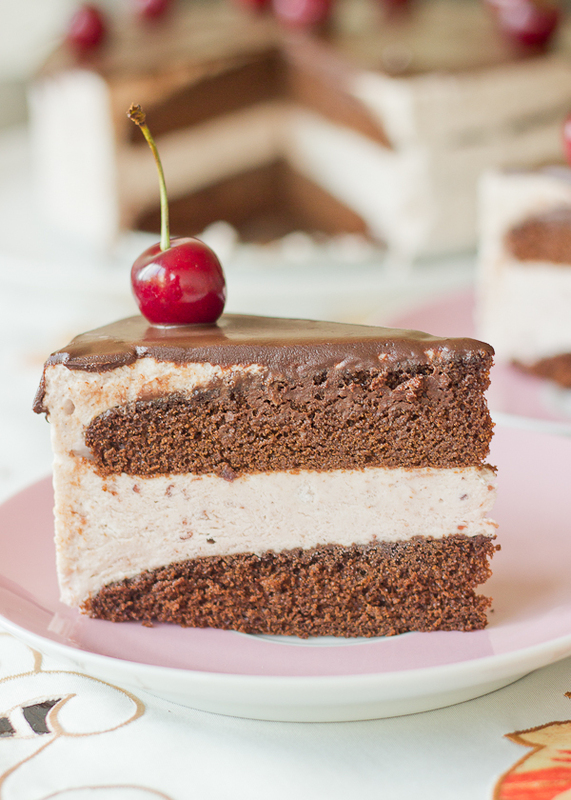 The official name is Cherry Mousse Chocolate Cake but right now, I just call it THE CAKE. The name is quite explanatory, pretty much this is chocolate cake with cherry mousse, but the cake itself is far more elevated than that. The chocolate layers are adapted from My Baking Addiction’s Best Chocolate Cake. They are moist and decadent and they literally melt in your mouth. 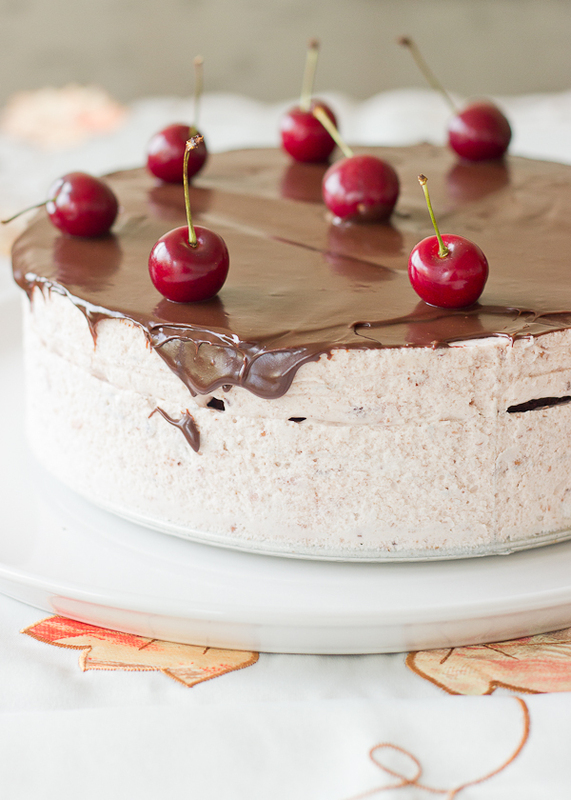 The mousse is light, airy and cherry. And everything is brought together with a thick layer of chocolate ganache. 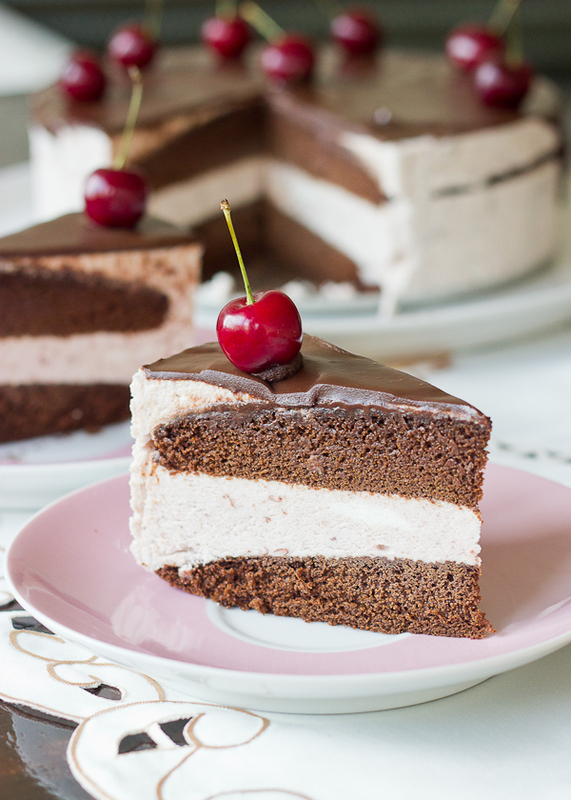 And one of the best things is that the time and efforts invested in the cake are nothing compared to the satisfaction and delight provided by this Cherry Mousse Chocolate Cake. I’ve had a lot far more complicated projects and compared to them this cake is whipped up in a blink … well, almost. Just mix the cake, you will only need one bowl, pitting the cherries can be a bit tedious I know, but get it over with quickly, make the mousse, whip up the ganache, and you are done! It does take some time for the cake to set, but you can relax and read a book while you wait. Be prepared to receive a lot of exalted exclamations, pure admiration and awes when you serve this cake. Chocolate layers adapted from My Baking Addiction’s Best Chocolate Cake. Butter and flour the bottoms and sides of two 20 cm/8 inch cake pans and line the bottoms with baking paper. Preheat your oven to 170°C/350°F. In a bowl place all the dry ingredients: sugar, flour, cocoa, baking soda, baking powder and salt, and mix thoroughly with a wire whisk. In a large bowl place the eggs and beat lightly with a whisk. Add the yogurt and mix. Add the coffee, oil and vanilla and whisk to combine. Add the dry ingredients to the egg mixture in three additions and whisk after each addition until just combined. Pour the batter into the prepared pans and bake for 18-20 minute or until a toothpich inserted into the center of the cake comes out clean. Mix the cherries with the sugar and let macerate for 2 minutes. Blend in the food processor or using an immersion blender. Place the sauce over medium heat and bring to the boiling point, decrease the heat and let simmer for 5 minutes until it starts to thicken. Remove from the stove and let cool. Meanwhile, place the water in a small, shallow, microwaveable bowl and sprinkle the gelatin over it. Let sit for 5 minutes to bloom and heat in the microwave on ⅓ power in 20 second intervals, stirring after each one, until the gelatin is completely dissolved. Add the gelatin to the cherry sauce and mix it well. Make an Italian meringue. Start whipping the egg whites on slow speed until foamy. Meanwhile, place 100 gr. of sugar and 2 tablespoons of water in a heavy-bottom saucepan and place over medium heat. Let the mixture boil. Let it boil for 2-3 minutes. Remove from the heat and increase the speed of your mixer to high and gently pour the sugar into the egg whites, taking care not to pour over the beaters. Whip the egg whites until the bowl no longer feels warm to the touch. Mix the heavy cream with the sugar in a cold stainless steel bowl. Mix, using the whisk attachment on high speed of your mixer until soft peaks form. Mix the three components - the cherry sauce, the Italian meringue and the whipped cream. Fold 250 gr. (9 oz.) of the cooled cherry sauce (you will have some leftover sauce) into the cream. Add the meringue to the heavy cream, fold it in three additions. Chop the chocolate in a bowl. Add the butter and honey. Bring the heavy cream to the boiling point on the stove or in the microwave. Pour the hot cream over the chocolate and let the mixture sit for one minute. Using a wire whisk, mix the ganache until it becomes glossy. Place the first chocolate layer on the bottom of a 22 cm/ 9 inch wide and minimum 8 cm/3 inch tall spring-form pan and center it. Pour ⅔ of the mousse over it, also filling the gap between the cake and the pan. Even the surface with the back of a spoon and place in the freezer for a minimum of 20 minutes. Remove the pan from the freezer, the mousse should be set, and place and center the second chocolate layer. Pour the remaining cherry mousse over it, smooth the surface and return to the freezer for minimum 2 hours, preferably over night. Take the cake out of the freezer, release gently from the pan and pour over the ganache. 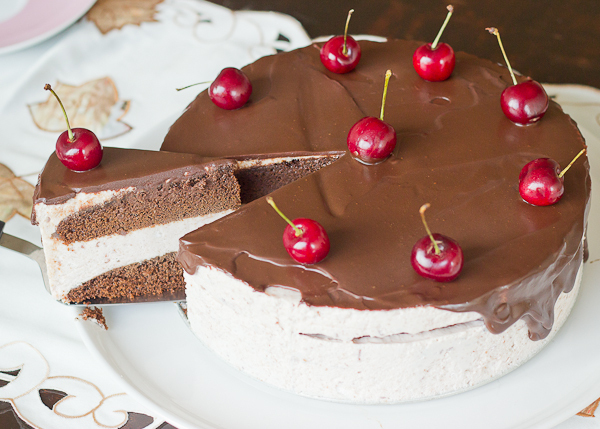 Decorate with cherries. Let sit in the refrigerator for at least an 1 hour before serving, so that the cake has time to loosen. Yay! Thank you, Caitlin! You should definitely try it sometimes! The pictures look awesome, mouthwatering! I love the cherry mousse layer! Thank you, Roxy! I am very happy you like the pictures! I really love mousses! 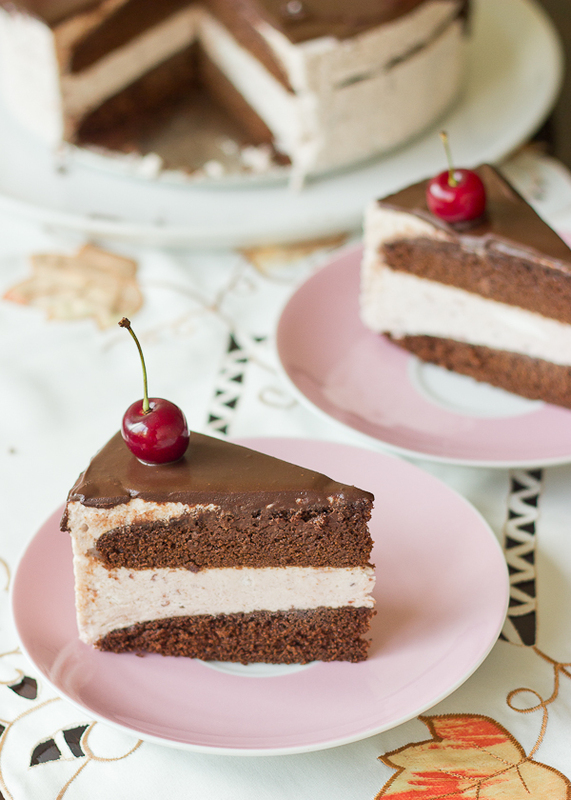 Cherries and chocolate are perfect together, you should try it! This is such a beautiful looking cake!! Your photography is beautiful! Thank you so much, Ami!